Yes, that is Roy Wood, who would form ELO after his stay with the Move. Wood wrote “Blackberry Way” as a response to the Beatles’ “Penny Lane.” As you can hear, it is gloomier and definitely more strung out. The singer is Carl Wayne whose accented voice works perfectly for the song. Ever since first hearing this song, I have always liked something about it. It does not blow you away. It is very weak on the psychedelia, even though it does fit into the category of Psychedelic Rock. Perhaps, it is the song’s simplicity that I enjoy. 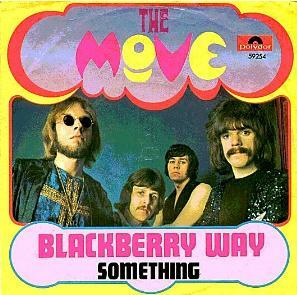 It was The Move’s most successful single (reaching number one on the UK charts). I believe it garnered such attention because it was not an over-the-top release. It is what it is and what it is, is good.